The doom and gloom of winter is almost behind us; we can look towards the next season and wonder what it has in stock for us, both with the weather and with fashion choices. As spring gets nearer, we can start to get excited about the next collection of colours, patterns and designs that are coming our way. So, whether you can’t wait for summer to arrive or you’re still revelling in the wintry weather, here’s a look at some of most prevalent SS18 prints that you’ll see emerging throughout the season that your customers will be searching for. It may sound obvious and even a little cliché, but florals are back for spring. We probably all expected it and the fashion industry has delivered once again. This year’s floral prints have been reinvented as much as possible, offering a vast range of colours and patterns. From large, blooming flowers to smaller tight-knit prints, you can be sure it’ll be everywhere in a matter of weeks. Using pastel colours perfect for the warmer months, as well as bold shades to represent a more tropical feel, SS18 brings a whole new choice. 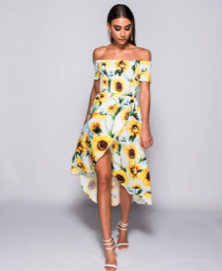 Introducing vibrant sunflowers and leafy prints as well as the more traditional floral designs, throughout the next season you’ll see an abundance of dresses, playsuits and jumpsuits that adopt this timeless choice effortlessly. Whether it’s a nautical theme you’re after, or just an injection of colour in an aesthetic pattern ready for the summer months, stripes have been making an appearance for SS18. Using pastel shades again, this season’s stand-out stripes are as seasonal as they are stylish. The perfect alternative to florals or other popular prints out there, mix and match your collection with key striped designs that include summer dresses and jumpsuits that can be worn all season long. For something different entirely this season, abstract prints are big for SS18. Offering something unique in the midst of a floral explosion, abstract prints encompass a number of different designs; from geometric shapes to seemingly random patterns. Eye-catching and distinctive for the upcoming season, they take on a bold appearance to ensure you stand out from the crowd this summer. Using in-season colours and trends including co-ords, abstract prints are great for breaking up your collection with something out of the box.